Wood Duck 14 Hybrid 13' 9" 52 lbs. 30 in. 400 lbs. 49.5" x 21" 200 - 350 lbs. 25" 16 6"
» view the Wood Duck 14 Hybrid materials list and order a la carte! The Wood Duck 14 Hybrid substitutes cedar strips for the standard plywood deck, while the stitch-and-glue hull and underbody is identical to the standard version. Thus it's a "hybrid" of a strip-planking and stitch-and-glue building techniques. Wood Duck Hybrids offer builders with more woodworking skill the opportunity to customize their kayaks with creative strip patterns and designs. 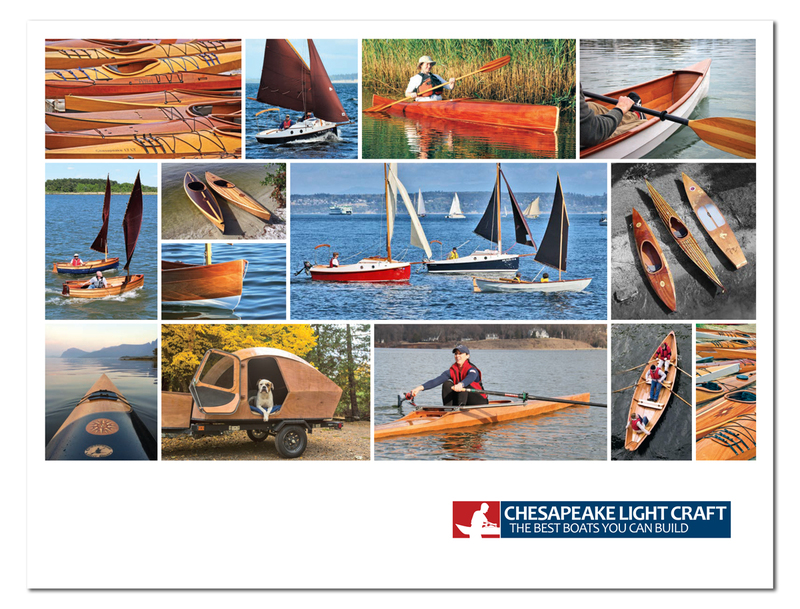 As a curious historical note, "hybrid" as a term describing a plywood kayak with a cedar-stripped deck actually predates the rise of of the hybrid automobile. We still get a lot of email wondering if the Wood Duck Hybrids are electric-powered (they are not). The Wood Duck 14 is a big, versatile kayak in a compact, ultralight, easy-to-build package. The Wood Duck 10 and Wood Duck 12 have been runaway successes; kits rarely stay on the shelf here for more than a day or two. The Wood Duck 10 is a super-light, super-easy-to-use rec boat for anyone up to 200 pounds or so. The Wood Duck 12 has a bigger payload and enough waterline length to cover miles with the sea kayaks. By having designer Eric Schade add a little more volume, however, we could help out two kinds of paddlers: those who need a really generous amount of room for comfort, or those who need the space in the cockpit for a toddler or---more commonly---a big dog. The Wood Duck 14 is also an amazing platform for serious fishing. Again, the cockpit is absolutely voluminous. The amount of cockpit volume indicated a need for watertight bulkheads both fore and aft, so those are standard in the kit to make it easier to self-rescue. Flush deck hatches are also standard in the kit. Plans for the Wood Duck 14 include full-sized patterns for every part, the comprehensive step-by-step instruction manual, and of course materials lists and finishing detail.